The Welsh demonstration and experimental areas site selection process for the PROGRASS Life project attempted to meet several criteria. The first was to ensure relatively close proximity to the Aberystwyth area where the PROGRASS plant will ultimately be situated. 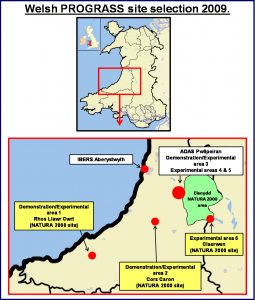 It was also deemed important that the selected site swards were representative of upland hill types in Wales, and particularly those that are of concern to both nature conservation organisations and the agricultural industry. The area selected (mid-Ceredigion) is characterised by upland acid sward types with relatively low production levels and limited potential for biodiversity (generally <15 species/m2). Historical government subsidies caused vast areas to be heavily agriculturally improved. The semi-natural vegetation communities that remain are found where cultivations were either economically or physically unviable. Therefore, site selection for the project has been made difficult due to the limitations of available contrasting swards in the area and the ability to access them with harvesting machinery. Wherever possible NATURA 2000 designated sites have been selected. The remaining selected sites are all situated less than 1 km from adjacent NATURA 2000 areas and are of representative sward types.